Virginia based fine artist and designer that creates commissioned illustrations, paintings and both logo design and brand identity for clients, audiences and personal use. Daniel Sumerlin (born 1982) lives and works in Virginia and in 2009 received his BFA with a Concentration in Graphic Design from Old Dominion University. 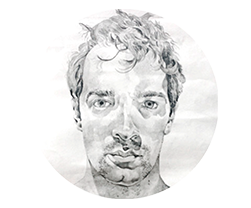 Upon graduation, Daniel focused on freelance design and brand identity for several local and national companies in addition to illustration and fine art. As of 2010, Daniel has been the Senior Design Consultant at InMotion Hosting. He continues heading Daniel Sumerlin Design Studio as well as exhibiting regularly and participating in nationally acclaimed art shows. In May of 2010, Daniel won the Sand Dollar Award in Mixed Media at the Boardwalk Art Show and Festival.